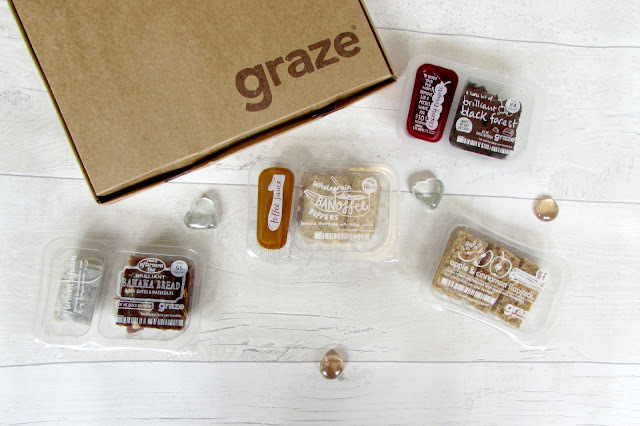 So today I'm going to be showing you what I've received in my recent Graze box. So I started the Bakery box recently and I'm loving what I get in these boxes and I'm so happy I decided to change the subscription but here's what I got in this week's box. Banana Bread- I love banana bread so when I saw this I was so excited to try this out but I still haven't eaten this yet but I'm so excited. In this little snack you also receive a teabag so I'm thinking this will be perfect to take to work and have them together. Banoffee Dippers- This one was so delicious and I really recommend anyone trying this but it was banana flavoured shortbread with a toffee dip and the banana was so strong but this snack was so delicious and I really wish I would of had a second one of these. Apple & Cinnamon Flapjack- I love Graze flapjack so no surprise this was the first thing I tried out of this box but this was delicious as always and I have to say I'm not too keen on cinnamon but I really enjoyed this and it was gone in seconds. Black Forest- This is one of the cakes I'm definitely excited to pick up as I feel I'll love this cake but it's a black forest cake with a cherry dip and I know this will also be delicious but I feel it may also be a little too rich for me but I'll definitely give it a try before I decide if I like it or not.